How can I filter between sites? 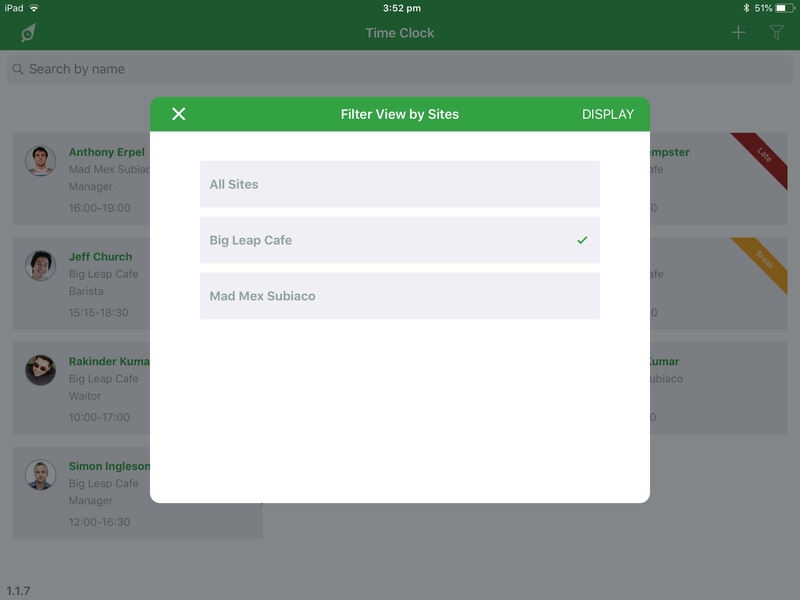 If your account has a large number of sites registered, you may wish to filter the list of shifts appearing on the Time Clock by filtering to only display certain sites. 1. Click the Filter Icon To filter your sites on the main view of RosterElf's Time Sheet, click on the filter icon which appear on the top right of the screen. The tablet will display a list of sites for you to select that you wish to display. The Best Investment You Will Make. Save 8 Hours A Week. Take the pain out of chasing staff for availability, building and communicating rosters, keeping timesheets and entering payroll data. Set your business targets and view actual costs in real time as you build your roster as well as eliminate time theft through photo recognition clock-in-out. Make employees responsible for keeping their availability and leave requests up to date and ensure they are always aware of rostered shifts.